Canadian politician Danielle Smith and her conservative Wildrose Party are hoping to unseat the liberal Progressive Conservatives and set the agenda for Alberta's future. It's unfortunate for her, then, that her party sounds like the name of a gentleman's club and her campaign bus has wheels in a particularly awkward place. 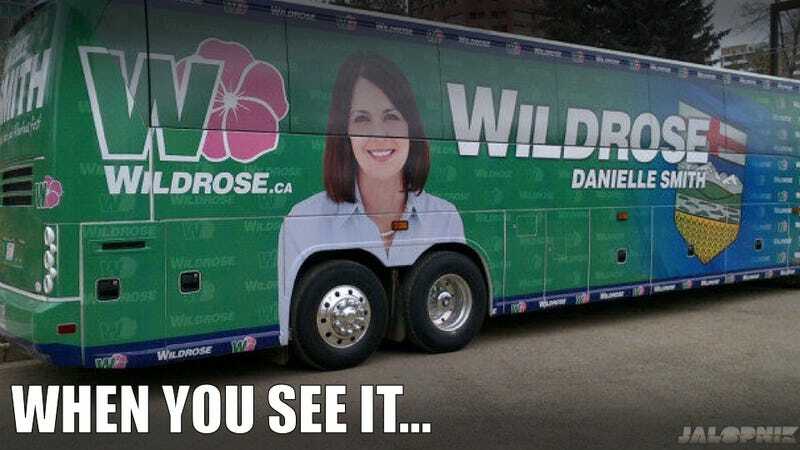 They're calling it the Girls Gone Wildrose bus. The campaign bus was launched as a sort of kickoff for the strangely named Wildrose Party, and kick it off it did. It's become the source of humor for whatever counts as political satirists in America's hat. A campaign spokesman tells the CBC they're going to fix the bus so that voters can focus on "issues" and not, apparently, her gigantic rubber breasts.